Here’s a list of Army research and development projects from a document I obtained — dated November 2013 — covering the next five years. I was surprised, well not really, that so many are just continuations of what is already being done in Afghanistan, but not surprised how much is to tame the information monster. Don’t see much though that reflects any kind of commitment to some future big war. Axton SMART AT-32S 8-watt IR floodlight. Improvements to Remote Monitoring System (RMS) Direction Finder. Integrated Blast Effects Sensor Suite (I-BESS). Marathon Robotic Human Type Target (RHTT) System. Prioria Maveric lightweight, portable unmanned aircraft system (S-UAS)..
Prox Dynamics Nano Unmanned Air System (UAS). PUMA DDL upgrades to PUMA DDL launcher, battery and 9 DB GCS antenna. Found a little more about Tailored Access Operations (TAO), the Computer Network Exploitation/Computer Network Attack (CNE/CNA) operation of NSA, long known, but mentioned in the Washington Post article last week revealing the National Intelligence Budget. The Post describes TAO as “surreptitiously installing spyware and tracking devices on targeted computers and mobile-phone networks.” I think that description is too broad. The Network Warfare Team (NWT) provides liaison between the military and TAO. I was reading Joseph Trevithick’s piece on Afghanistan war command and control arrangements in Tom Ricks’ Best Defense blog, and it made me think about all of the organizations that I’ve tried to figure out over the years and why it’s so difficult. Ricks’ readers provide erudite references to military histories and recommendations to read joint doctrinal manuals, suggesting if one just mastered the war college reading list one would get it all. It also seems a subtle message that war should be left to the professionals. Afghanistan is a particularly acute example of dysfunction though, one that reflects the nature of that country, our world, and the so-called war against terrorism. First and foremost, everything about Afghanistan is tribal, which is to say, that the society is intensely tribal, split along family, ethnic, geographic, religious, and class lines. We could learn something from the nation: It is both the reason why our e pluribus unum mission is so foolhardy and why our own organization there is so screwy. Second, there is secrecy involved, not just the secrecy of military operational security to keep the enemy off balance and guessing but also the secrecy of competing bureaucracies and an evasive executive branch (military and intelligence community) trying to keep others out of its business. Third, 9/11 spawned a very bad habit, predicated on the Rumsfeld assumption that the uniformed military was antique, brain dead and didn’t work. So from day one in Afghanistan, the practice was to muscle aside the existing in favor of the ad hoc. Of course this also benefited secrecy and evasion of oversight. The price has been profound (and obscenely expensive). Just look at how the Joint IED Defeat Organization (JIEDDO) has created its own army, its own air force, its own special ops, its own intelligence establishment, its own task forces, even procured its own equipment, and you get a flavor. We are ourselves intensely tribal, but we are also amazingly rich, so not only do we start every endeavor well-endowed with diverse organizations but we keep building on them, unable it seems to let anything go or say no to anyone. That’s why our Department of Homeland Security even has a unit in Afghanistan, advising local border authorities, with its own chain of command, budget, support structure, etc. “NATO Members: Albania, Belgium, Bulgaria, Canada, Croatia, Czech Republic, Denmark, Estonia, France, Germany, Greece, Hungary, Iceland, Italy, Latvia, Lithuania, Luxembourg, Netherlands, Norway, Poland, Portugal, Romania, Slovakia, Slovenia, Spain, Turkey, United Kingdom, United States of America. Euro‐Atlantic Partnership Council (EAPC): Armenia, Austria, Azerbaijan, Belarus, Bosnia and Herzegovina, Finland, The Former Yugoslav Republic of Macedonia, Georgia, Ireland, Kazakhstan, Kyrghz Republic, Malta, Republic of Maldova [sic], Montenegro, Russia, Serbia, Sweden, Switzerland, Tajikistan, Turkmenistan, Ukraine, Uzbekistan. We tend to blame coalitions or NATO or those Europeans or Washington or even the command in Florida for mucking about in sacrosanct military business, as if some literal interpretation of the manuals is the answer. What an evasion. No wonder the war is endless, expensive, and has no chance of achieving any publicly-understood outcome. What ruins it for me in Bob Scales’ eloquent op-ed – “Too many wars, too few U.S. soldiers” — in The Washington Post about the Afghanistan shooting and the state of our Army (and armed forces) is that retired Maj. Gen. Robert Scales also makes an unsatisfying argument on behalf of his institution and a military solution. I agree whole-heartedly with Scales, who I count as friend and colleague, that the young soldiers shoulder an “enormously disproportionate share of emotional stress.” And I believe something is very wrong. I imagine that retired Air Force major general Dunlap, whom I always enjoy, isn’t suggesting a rethink in the same way Scales is. To the airmen, manpower-intensive means boots on the ground, in other words, an argument for more airpower. So: More Army? More Air Force? A new, new counterinsurgency doctrine to fight forever wars? Those are our choices? One area where Dunlap is inadvertently wrong and Scales is right though is that there are not “millions who serve in uniform.” Well, not in the way Dunlap means that there are millions. There are technically just over two million in the active duty and reserves; but the military is nowhere like it was during the draft days of Vietnam or the true mobilization of millions in World War II or the Korean War. And within that two million who serve are a far smaller number of deployable military personnel. And within that few hundred thousand who deploy into Afghanistan (or did into Iraq) are a far smaller number who leave the (relative) safety fortresses to fight. I know out there somewhere are some facts to back me up – that only a scandalously small percentage of all people in uniform have even ever deployed once to those actual countries; in other words, most do in fact shoulder the majority of the burden. No one has cynically created this circumstance, but the military institution is well aware of this now ten-year old reality. Firepower has become so concentrated and networks have become so large and ubiquitous that only tiny numbers of soldiers are ‘needed’ on the front lines compared to Scales’ days. But as Scales and Dunlap both know, firepower isn’t what is going to win these wars, any more than a larger military or an air force/special operations dominated head-hunting campaign would. We all share the blame for this ethical quagmire. We cede war-making to an increasingly isolated professional caste, we cede to them the design and makeup of the military, we facilitate and tolerate what Scales calls “exploitation” of a few as long as the dangers are kept away from us, and we don’t pay attention until our well-oiled and distant machine has a breakdown or an industrial accident. And once the breakdown occurs – the rogue soldier, the errant bomb, the Abu Ghraib – we expect the floor managers and professionals to fix the machine. To paraphrase someone: We are the machine. Here! Here! Everything you need to know about Afghanistan shooting!!! I wasn’t planning to write about the Afghanistan shooting, don’t want to write that kind of a blog. But it’s kind of difficult to get away from the incident, and the truth of the matter is, why bother to blog at all if no one’s going to read it? Which is to say: this minute’s views/comments are what matters in the 24/7 blah, blah, blah of a world, the mainstream news leading the pack with the greatest resources. The corrosion of our discourse about everything, even serious things, is proven by the universal demand of who can move the quickest, which will be the go-to news service, who will produce new details, which will turn the cleverest phrase, which gets the best quote. Heck, this blog might even get read because I’m clever in saying I’m already sick of it. So, to dispense with it all, here’s all you need to know: If you were against the Afghanistan war, this is proof and affirmation; if you’re in favor of the war, this is just a hiccup on the way to promising progress. What more is there? If you think the military kills indiscriminately, you still think it; if you don’t, you’re mad at all of those who think that the military kills indiscriminately. If you’re Afghan, you’re outraged. You’re probably not outraged if 16 school girls were gunned down in a dispute over family or tribal honor, you’re not outraged over corruption or human rights in general. But you didn’t have anything better to do today anyhow. If you hate the United States or hate Obama, this is reason to hate. If you’re Foreign Policy or some other Washington-establishment rag, you do the requisite round-up of comments, as if anything is outside the proscribed scripts. If you’re RT.com (TV-Novosti) or some other news organization that loves to hate the United States, you write a headline like “Several drunk Marines behind bloodbath, laughed on shooting-spree, burned corpses.” Some Afghan eyewitness said it. Publicly, on the web, on Twitter, the President, Secretary of Defense, NATO head, chairman of the Joint Chiefs, CENTCOM, and ISAF on down to the janitor at the Pentagon all apologized and expressed their condolences. Obama even called Karzai and called the incident “tragic and shocking.” The White House released a picture. That kind of makes it a crisis, elevates it and debases it all at the same time. By noon I imagine the information warfare maven will be predicting and wagering on the state of the battle of hearts and minds and selling your theory of what needs to be done. Scratch that, they were on it yesterday. 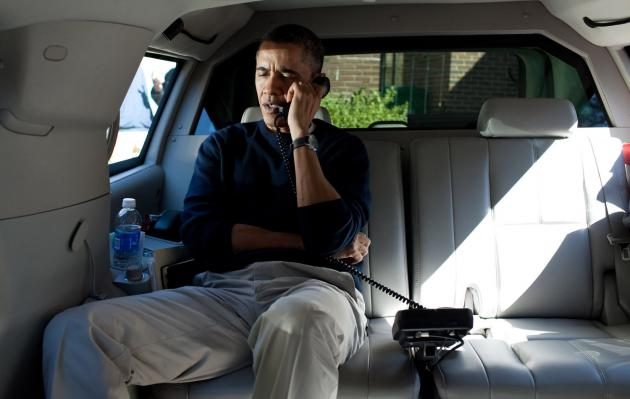 President Barack Obama talks on the phone with Afghanistan President Hamid Karzai from his vehicle outside the Jane E. Lawton Community Center in Chevy Chase, Maryland, on March 11, 2012. UPI/Pete Souza/White House. Who exactly is spying on who, and for what? The latest Wikileaks peak into STRATFOR Emails is being described as a unique insight into some shadow CIA, while meanwhile some are worried that the Department of Homeland Security is monitoring social media and conducting surveillance of OWS activists. There is a little bit of truth in both stories, but it is such small potatoes. Into the breach marches an army of private contractors, who do a brisk business and are engaged in a death struggle with each other to find people who can speak obscure languages AND at the same time qualify for Top Secret clearances. Arabic and the languages of Afghanistan and Pakistan (Dari, Pashtu, Urdu) are the priorities, but Farsi speakers, the language mostly of Iran, are in high demand these days. As are African languages, because, well, we have a new African Command that is creating its own empire. I compiled a list of the languages in demand right now, the companies who are looking for Top Secret cleared applicants, and some of the locations where the spying and analysis is done. Been on vacation and am going through the bits of curiosities that have made it into my inbox, my files, or my head in the week I was away. I’ll write about some in the coming days. On the most important immediate questions, the Afghanistan war continues to be defended despite public support and any plausible end-point worth the expenditure of any additional American treasure or lives. There is not even stability inside the government’s Ministry buildings and “military advisors” is becoming too frequent code for perpetual presence. There hasn’t been a war with Iran, and despite abundant cheerleading from the news media, the threats of war seem to have had no impact on Tehran. Again, it is the end-point that is the issue here, whether a nuclear Iran is even a plausible possibility and actual threat, and second, what Iran’s striving for nuclear weapons represents. Which brings us to the third issue of nuclear weapons and the Obama administration’s supposed commitment to deep reductions and nuclear disarmament. On so many levels, this is the proper focus and thrust for American foreign policy and international security, but it lacks any public traction or support, especially in a world where the WMD-obsessed counter-terror elite and the Washington war-mongers clamor for any kind of conflict – actual or imagined – for their sustainment. No wonder all of the nation’s state-level Guard leaders and 49 governors signed letters to the White House protesting planned military cuts, saying the Air National Guard in particular is taking an unfair hit. First of all, who’s the retarded governor who didn’t sign? Second, we decry pork-barrel politics and earmarking and Congressional interference but ignore that defense spending, and promotion of a perpetual threat, has become a way of life for us. Governors?